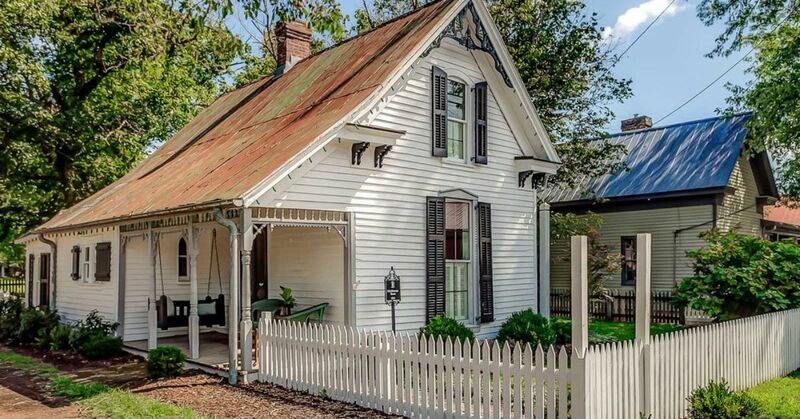 You can’t help but be charmed by the Sweeney Cottage in Leiper’s Folk, Tennessee. This house was built in 1892 for Carl Sweeney’s family. 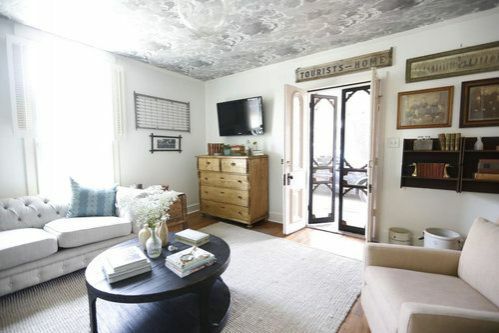 Owner Holly Williams, according to her Instagram account, stayed in the cottage in her early 20s while she was working in a sandwich shop next door as well as in an antique shop. A few years later, she got the chance to renovate the cottage. The house is filled with antiques she chose. The area has lots of things to do, and Holly will provide a personal recommendations through a travel guide when you book the place. 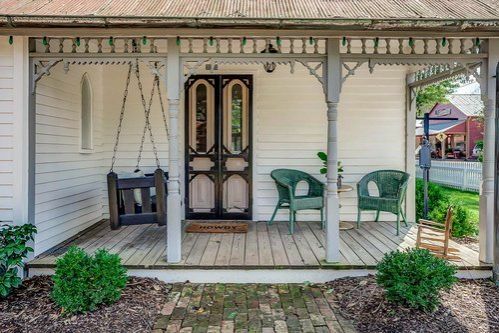 Enjoy a cold glass of sweet tea while reading a favorite book on the porch swing. Antique green wicker chairs provide additional seating. The combination of old and new really works well here as can be seen in the original 1892 arch entry doors painted in Pink Ground by Farrow & Ball. The frames of the original screen doors have been painted in Tricorn Black by Sherwin Williams. The “howdy” welcome mat at the entrance is a sure sign you are in the South. 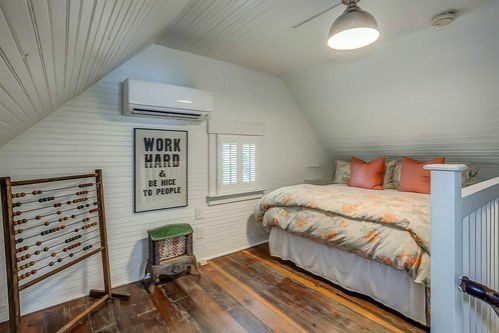 The shiplap wooden wall and the tongue-and-groove planks of the wooden floor complete the charming renovation of this old cabin. As you enter the living room, look up and you will be pleasantly surprised to see this unique cloud wallpaper on the ceiling called Nuvolette from Cole & Son. If you like to watch movies, a flat-screen television can accommodate that wish. Another option is to browse through one of the books on the coffee table from Epiphany Nashville. The walls were painted in Snowbound by Sherwin Williams. The soft pink chair across the couch is a swivel slider. 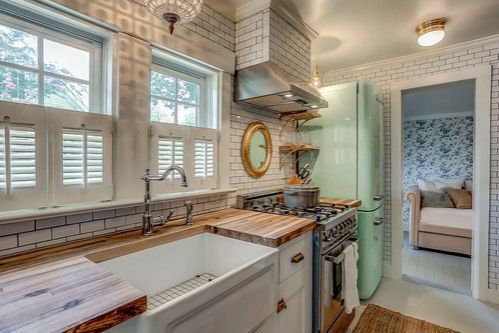 The butcher block countertops by the farm sink from Signature Hardware make meal preparations a delight. You’ll also find pleasure cooking meals with the Bertazzoni Italian stove. Enjoy storing groceries in the mint green Smeg refrigerator. Create beautiful memories while sharing meals with family and friends on this farm table from Scarlett Scales Antiques that seats up to eight people. The polished wooden floors add to the rustic vibe of the space while the eclectic collection of antique mirrors add visual interest to the walls. 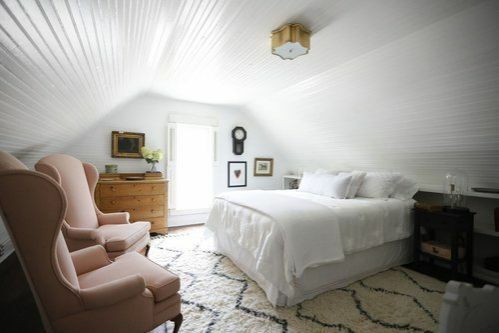 This all-white queen-sized bed is such a calming and peaceful spot in the home. A pop of color livens up the space courtesy of two pink armchairs rescued from the barn of Holly’s friend. The dresser came from Gas Lamp Antiques and the predominantly white textured carpet is from Wes Elm. Adding a touch of metallic is a basil flush mount light in brass from Visual Comfort & Co. The beadboard ceiling features Alabaster by Sherwin Williams. The guest bedroom also boasts a queen-sized bed. Adding a piece of Holly’s personality to the room is a print of her favorite motto that hangs on the wall. Both the abacus standing by the wall and the heater were vintage finds. The pine floor with its stain finish adds a feeling of warmth and coziness to the space. 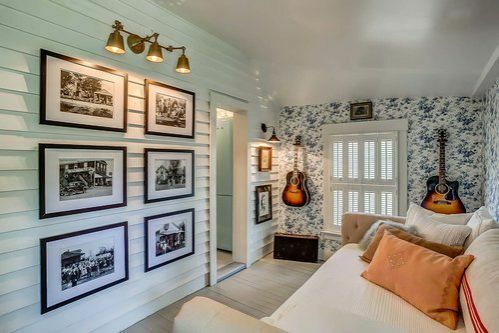 Music enthusiasts will appreciate the two Gibson guitars hanging on the wall covered with black and white wallpaper from Thibaut in the writing room. Photography fans will enjoy examining the framed black and white photos hanging on the original pine wall. 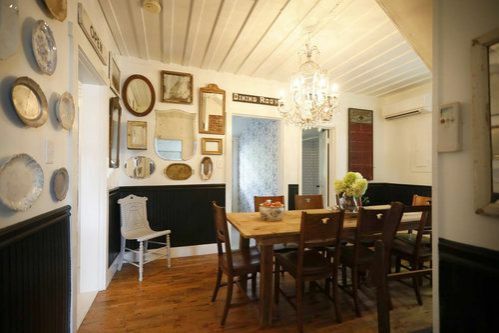 The hardwood floors are all original. The trundle bed is a comfortable place to take an afternoon nap. The word “wash” was created in the floor by Holly and her daughter Stella. 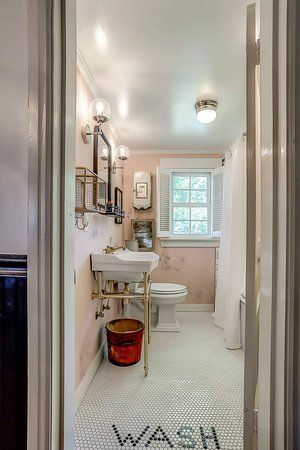 The bathroom features a tub and a handheld shower kit, along with a brass console sink and faucet. The blush wallpaper was from Custhom. Sconces from the Schoolhouse light up the space. The antique medicine cabinet came from Serenite Maison.